In this Guitar Control lesson, Instructor, John Maclennan is going to show you how to play Dear Prudence on guitar by the Beatles. This is a great song to kick start your fingerpicking. In this video John is going to focus on the intro only and really break it down. He is using an acoustic guitar himself, but you are welcome to use an electric on clean, or grab your acoustic, too! 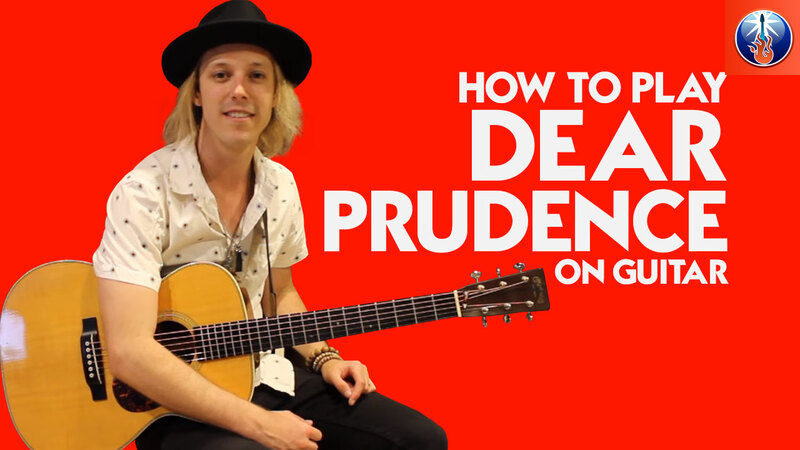 Step one in learning how to play Dear Prudence on guitar to help prep you with a few tips! 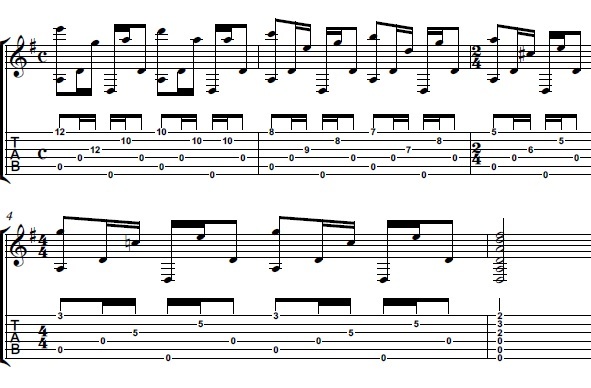 This song is in Drop D tuning, so John has lowered his 6th string down one full step, taking it from the standard E, to a D. If you aren’t familiar with Drop D tuning, all it is is lowering only your 6th string. So your 6th strings becomes and D instead of an E and everything else remains the same as it is in standard, so the 6 is a D, but the 5 is still an A, the 4 a D, the 3 a G, the 2 a B, and the 1st string is still an E.
We are going to start with these three note fretted chords, these triads. For the first shape we start out on the 3rd string 12th fret with our third finger, then your pointer on the 2nd string 10th fret, and your pinky on the 1st string 12th fret. You are going to strum that triad with a D note in the bass, so just picking the open 4th string above the frets you are holding down, strumming from the 4th string all the way down through the 1st string. Then you are going to go to a D shape, and this is just a little baby D chord, barring the 2nd and 1st strings with your pointer on the 10th fret and placing your middle finger on the 3rd string 11th fret. Strumming from the 4th string down through the 1st again. Then you are going to drop this shape down a whole step to a C shape. Same exact shape but now your barre is on the 8th fret 2nd and 1st strings, still with your pointer, and your middle finger is holding down the 9th fret 3rd string. Then he moves down to a G chord, placing his pointer on the 7th fret 3rd string, his ring finger on the 8th fret 2nd string, and his middle finger on the 7th fret 1st string. This looks just like an open D chord that you are probably familiar with but we are on the 7th fret, and it’s a G when played on the 7th fret. So just like a stock open D shape, relocated up the neck on the 7th fret. The next shape looks like the same we did right before the D shape on the G, But is now an A. Barre your pointer finger on the 5th fret on the 2nd and 1st strings and place your middle finger on the 6th fret 3rd string. This is an A chord with a D in the bass, since you are going to strum down from the open 4th string, which is a D. Then the last two chords are a C triad, place your ring finger on the 5th fret 3rd string, your pinky finger right under it on the 5th fret 2nd string, and your pointer on the 3rd fret 1st string. Again with the D in the bass, strumming from the open 4th string down. And then ending with our last chord! An open D chord. To play an open D chord you place your pointer finger on the 3rd string 2nd fret, your ring finger on the 2nd string 3rd fret, and your middle finger on the 1st string 2nd fret, and again and of course, strum from the open D string, strumming from the 4th string down through the 1st, just the stock D chord you are probably familiar with. If you are enjoying this Beatles song, be sure to check out our other lesson for how to play Come Together by the Beatles for another awesome, but very different Beatles song. To see john review all of these chords in order, slowly, go to the 2:11 minute mark. I hope you enjoyed learning how to play Dear Prudence on guitar! This is a great introduction into fingerpicking lesson by one of the most popular bands of all time, The Beatles. This song is truly beautiful and very fun to play. Enjoy taking these same fingerpicking concepts and applying them to other songs, to your own, or just mess around and write something new with them. It’s always great to not only learn the song, but learn from the artist and take it with you to spark your own creativity. And of course, as always, have fun! Hi, thanks for the lesson. The printed tab would be enhanced by showing the chord shapes so that we don’t have to try to transcribe them from the lesson video. The lessons of John are always amazingly good. Actually, he’s my favorite teacher on Guitar Control. Not only a very good guitarist, but also a great teacher: a combination you’d not easily find.